Home » dairy free » Bok Choy Deviled Eggs with Bacon! Bok Choy Deviled Eggs with Bacon! These easy bok choy deviled eggs with bacon are perfect for a party or picnic. If you love to hide vegetables in foods for your kids, you will love this recipe! Are you looking for a new idea for bok choy? When I use bok choy, I tend to get stuck in the stir fry rut. Often, it is hard to find certain organic vegetables in the stores. Grocery stores usually have the “popular” organic vegetables like lettuce and carrots, but if you want something more fun, like bok choy, it can be difficult to find it grown organically. I instantly gravitated towards a deviled egg recipe with bok choy and bacon as the main ingredients. When in doubt of a vegetable, bacon will always save the day! Bacon makes these the best deviled eggs because it hides the bok choy :-). I turned to Chef Watson for a little inspiration. It was a little worrisome when CW told me to dig out my Asian fish sauce. Now that I look back, it makes perfect sense as bok choy is an Asian vegetable. Although CW tends to get a little carried away with ingredient quantities, his food pairings tend to be right on. Boil six organic cage free eggs. Eggs are high in omega vitamins and have yolks that are a dark yellow, almost orange. I used my chopper to chop up the bok choy into small pieces. Here is the egg mixture. As a big time bacon lover, I think it is great that I could use bacon grease instead of mayonnaise in this recipe. Here is a link to all of the appetizer recipes at Fearless Dining. In a large pot, boil eggs for 10-12 minutes. In a skillet, cook strips of bacon. Reserve grease and chop bacon into small pieces. When eggs are finished, dump hot water out and put eggs into cold water and let cool. Chop bok choy into small pieces. When the eggs are cool, cut lengthwise in half. Scoop yolks into a small bowl. Add bacon grease, bok choy, fish sauce, and dijon mustard. Mix well and season with salt and pepper to taste. With a teaspoon, fill each crater in the egg white with the yolk mixture. Sprinkle with bacon bits and extra thinly shredded bok choy. Put in refrigerator to cool for 30 minutes. Love bok choy? 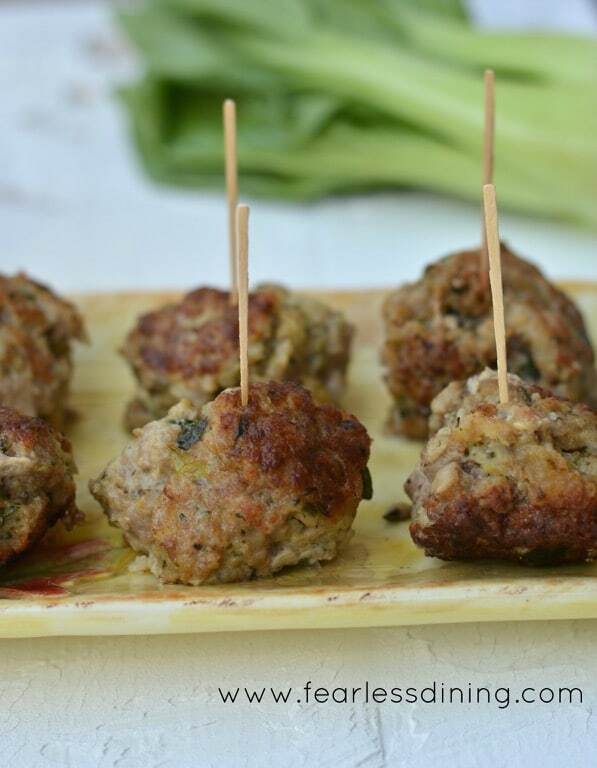 Try this recipe for Gluten Free Bok Choy Meatballs. Now if only I could make this out of quail eggs, sadly they are tiny. Oh wow, would never have thought of that. I never would have thought of this. I also love anything with bacon! These are a perfect appetizer for holiday parties! I love serving things that anyone can eat and they don’t need to know it’s gluten-free. I love deviled eggs and don’t have them enough. Your recipe looks fantastic!! G’day These look absolutely delish! Love the addition of bok choy to your deviled eggs..so creative, healthy and delicious! What a fun and new twist on deviled eggs. I really like deviled eggs and you can make great combinations as you have done here. haha! I agree, BACON always saves the day when you have vegetables you might not be too sure of! I had fried rice with bacon and bok choy tonight, coincidence!! Your eggs recipe looks delicious, and the added crunch from the bok choy will be perfect. I will try this for sure! I think the bacon grease might be my favorite ingredient, I don’t think it gets used enough. Sounds like a very tasty dish. Never would have thought to combine asian flavours with deviled eggs. Seems like such a strange combination but I guess it must taste great. You have definitely got me curious to know what these deviled eggs taste like! I also took pause when I hit the part about Asian Fish Sauce – can’t wait to try these!